There is some variation of the raw material that being used for furnitures frame. Rattan and aluminum are both used in the creation of chair frames, specifically outdoor furniture frames. Traditional frames for wicker furniture were made from various tree materials, including bamboo and rattan, but modern versions include metals such as aluminum for sure. 1. Rattan is typical climbing palms tree that being used as the raw material for cane furniture industry. There are over 600 different species of rattan have been recognized, which is belong to 13 genera. Most of rattan is growth in tropical rain forest, where in much of South-east Asia is represent the most important forest product after timber. Along with its growth, rattan will bend back down toward the ground before snaking out like vines through other trees and plants or that might be surrounding it. 2. 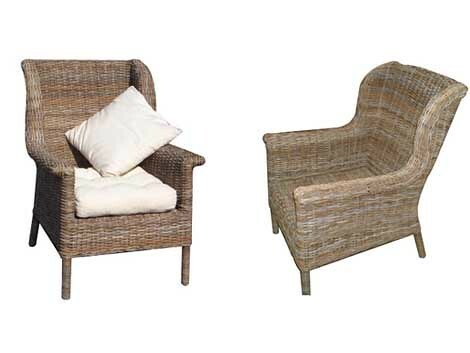 Wicker and rattan should not be confused. Rattan is used to make the framework of the chair, the poles on which it is based. Wicker is the slats of wood wrapped around the frame to make the surface of the chair, bound closely to add support and protection. While the wicker slats can be made of rattan, they can also be made of bamboo or another type of wood. Rattan wicker typically costs more than just the rattan framework. While durable, rattan tends to absorb moisture over time and will eventually began to lose integrity. 3. Aluminum is an ideal metal to use for the framework of chairs. It is very lightweight and it does not rust, leading to very sturdy and dependable frameworks. The primary problem is on its appearance. Aluminum will always look like a metal, even when it painted, while rattan has a natural, wood look that may fit in better with certain styles. Aluminum is also more difficult to paint, and many finishes will eventually flake off, whereas rattan absorbs paint more dependably. 4. Since wicker is a delicate part of the chair and most susceptible to wear, some manufacturers produce a synthetic version, combining resin and tree fibers to form their own wicker, designed to last longer and be more resistant to outside elements. This does not mean the frame itself is made from synthetic rattan or any other type of synthetic wood. While wickers can differ in terms of construction, a rattan frame is almost always made from authentic rattan timber. 5. Wicker chairs are mixed and matched when it comes to frames. Other metals like steel are also sometimes used, but steel rusts in the outdoor weather and can eventually compromise the appearance of the chair. It should be noted that aluminum does not rust but does oxidize in its top layer, leaving a white film in places where the metal is exposed. This entry was posted in About Rattan. Bookmark the permalink.